As far as tactical marketing skills were concerned, these were learned on the job – and it’s worth remembering that at this point the concept of a website was a new one, getting a mobile phone by your 25th birthday was early and social media was reading newspapers in the library. Since then we’ve lived through a digital revolution that, although presenting new challenges, has enhanced all of our lives in general. But this digital revolution has also made the marketing landscape a lot more complex with so many individual disciplines evolving from from the development of countless digital platforms. Unfortunately, what hasn’t changed is how we recruit marketing people. As a small business economy most companies with a marketing function will only have one person in the marketing seat. At the first The Future of Marketing event in May 2018 Andi Jarvis of Eximo Marketing Strategy used his presentation to look at a typical job specification for a marketing executive or marketing manager role. To use Andi’s analogy from the Future of Marketing event, these job descriptions are looking for a marketing unicorn. They are set up to fail from the outset. The result is that the organisation’s perception of marketing is harmed and the personal reputation of the person handed this hospital pass of a job description is damaged. Not to mention to resulting dent in the personal confidence of that person which will adversely affect their performance in the next job they go to – and may even cause them to decide that marketing isn’t for them. One of the consequences of the digital revolution is that marketing is now required to be much more than it ever was before in terms of the skills required for successful execution of campaigns. Despite this change in the environment we still expect one person to be able to do it all. It’s simply not possible and the evidence is all around us. Look at the variety of agencies that now exist to help marketers address these issues on a daily basis. The skills required to be successful in all these disciplines are hugely different. An Events Manager is a very different person with a very different skill set to a PPC specialist. A UX architect is not the same as a PR professional. In order to find your place in the new marketing landscape it’s time to choose your weapon. What do your skills and personality make you best suited to? Where are the best opportunities for you to advance your career. Having spent almost 20 years in global marketing roles I made the decision to specialise in video a number of years ago and that led to the formation of our video marketing agency. The move to individual specialisms, whether they be video, PPC, UX or PR is based on the concept of “inch wide, mile deep” – or put simply, rather than knowing enough to be dangerous in a whole lot of areas it’s better to focus on one area and make sure you eat, sleep, breathe and live how to develop a clear strategy and execute campaigns that deliver the highest return on the marketing investment. But what about the companies who can only afford to hire one marketing person? It’s a valid question – and the answer is simple. Recruit for different skills. This one person will most likely spend their time managing relationships and projects with a range of external agencies or individuals with the relevant channel skills. So they don’t need all the skills in the unicorn job description. They need problem solving skills, project management skills, analytical skills and the ability to build relationships within the organisations that they inhabit. If we recruit for these skills along with a solid understanding of marketing principles then we’ll all get better results. This is what our schools, higher education providers and universities are for – not for teaching people how to hack instagram as @garyvee would have you believe. The Future of Learning features Diane Morrow (mTech Academy), Christine Watson (TrainingMatchmaker.com) and Marian Norwood (NW School of Marketing). The Future of Storytelling includes Noel Allen (Noisy Snacks), Dave Linton (Madlug) and Tina Calder (Excalibur Press). The Future of Social Media explores 3 of the main social media channels and features channel specialists Niall Parfitt (Linkedin), Gil David (Facebook) and Leanne Gannon (Instagram). The Future of Websites is covered by Andrew Maybin (Tibus and Zesty). The Future of Customer Experience features Rick Monro (Puppet). The Future of Automation is delivered by Rachel Davis (Hurree). The Future of Marketing is organised by BlueSky Video Marketing and you can find out more and get your tickets at the event website. 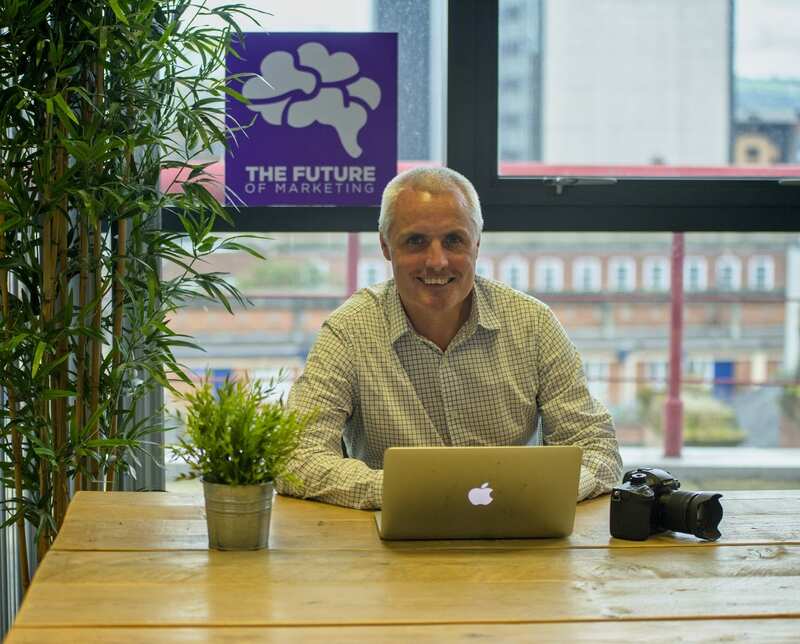 Peter Craven is the Founder and Creative Director at BlueSky Video Marketing, the curator of The Future of Marketing event series and an Education Ambassador on the board of the Chartered Institute of Marketing in Ireland.